Millions of people are affected by Canker sores of the mouth. These sore are painful open sores of the mouth. Most people are under the impression that they are viral infections and are contagious however, this is far from the truth. These ulcers are different than the herpes type lesions that are contagious. It is a condition that affects women more than men. 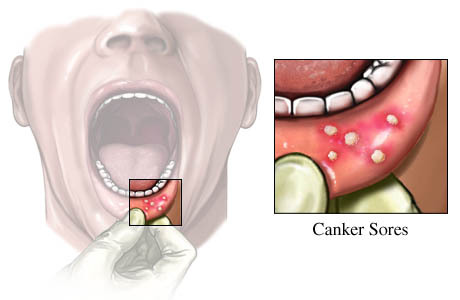 What really causes canker sores is not entirely known however this is an area of research. It is believed that immune deficiency may be responsible. Canker sores and cold sores have been used interchangeably to refer to the same condition but there are differences. Canker sores form on the movable parts of the mouth such as lips and inside cheeks and they are not contagious. Cold sores form on the non moveable parts of the mouth such as the roof of the mouth and they are viral and contagious. The reason these sore are so painful is because they are ulcerations and expose the sensitive tissue underneath. These sores do not reflect an underlying cause of illness however, if they come too frequently your healthcare provider can order tests that would assure there is no serious underlying cause such as Crohn’s disease,Celiac disease Lupus or even AIDS.